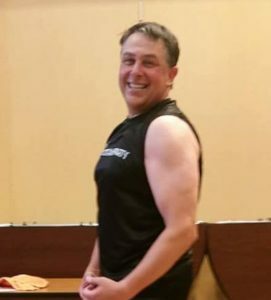 Introducing the Boot Camp Party July Member of the Month: Mike Santelli! He is a real BEAST!! “I want to share some thoughts about my experience with Dion and his fun, effective, and convenient Boot Camp Party (BCP) workouts. This testimonial comes after 8 months of working out 2-3 times per week with Dion. My history with Dion goes back about 6 years. I worked out with him for about 6 months in 2012, and got myself in great shape. Unfortunately, after those 6 months I started a new job and lost focus on my priority to exercise. I never should have let myself fall out of my fitness routine; because fairly quickly, most of my results vanished. Fast forward to October of 2017 – about 8 months ago – I decided to go back to Dion. I was turning 50 in 2018 and didn’t feel great about my appearance, stamina or strength. Maybe you know the feeling? 20 lbs. overweight, winded at walking 3 flights of steps, feeling weak when playing with your kids or doing yardwork, etc. The negative feelings all culminated in the fall of last year, so I decided to stop reminiscing about the shape I used to be in and take the first step. That’s when I came back to Body by Dion. Today I’m proud to say that I am again in really good physical condition. Don’t get me wrong, there’s more to do, but I’m well over that first tough hump, which is starting and sticking to it. I can’t say enough about Body by Dion. The workouts are really complete. Dion designs each session to target select parts of the body. Each one, however, brings with it really good cardio workouts as well. After eight months into my “return to the BCP” I feel great!! My clothes fit better (I’m down at least 2” on my waist), I’m stronger in all muscle groups, and I feel fantastic. It’s easy to forget how much exercise does for you physically and mentally. When you look better, feel stronger, and have more stamina, it makes you feel better about yourself. Clearly confidence improves, it seems easier to deal with stress, and your overall attitude and outlook improve. They say turning 50 is a big deal, and I guess it is in some ways. I am so grateful for overall health, and the fact that I am in such better shape has taken the edge off hitting the half century mark. I can’t thank Dion enough for the results I’ve seen. If you’re like me, you may need some extra motivation to get started on a workout; maybe you like to (need to) workout with others; maybe you need music to provide rhythm with the sweat; Dion brings all of this to the workout. He is a supreme motivator with a unique ability to push you, and he creates an environment that motivates you to push yourself. Dion works hard to ensure the music fits well with each exercise. The selected music not only adds to the flow of the class, it aids in motivation, and makes even the hardest exercises more attainable and engaging. I’m about to start my next session of classes with Dion. This time, I’m not stopping. Too much work has been put in, too many solid results have been attained, and now it’s a habit I look forward to.